Now I have another reason to love fall foods. 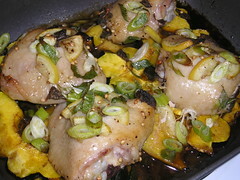 This is Melissa Clark‘s recipe for Roasted Chicken Thighs with Delicata Squash (except I only found acorn at ShopRite, so used that), from the New York Times in October. This was so very, very delicious that I went right out and bought more ingredients for a second batch to make soon, this time finding delicata squash at Whole Foods. The acorn squash was a bear to cut, and delicata looks much more “approachable,” with a thinner skin (I think) and more elongated shape. But whatever hard yellow squash you use, make sure to use all the ingredients called for (check out the link above), including the blanched lemon slices and scallions, as the recipe is beautifully balanced. Now I feel like I really get what “balanced” means. Thank you Ms. Clark!